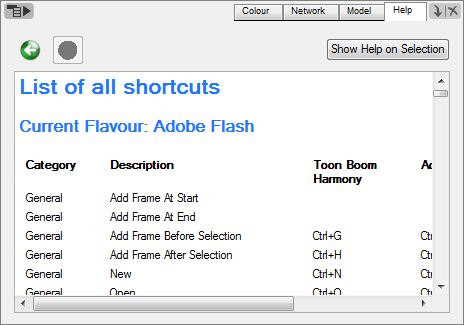 As you work on your project in Harmony you might find that you need a little help identifying some different layer types (module types in the Network view) or with immediate access to keyboard shortcuts. Harmony has a view where you can access all this information, known as the Help view. In addition, you can use the green forward and backward arrows, in the Help view, to review a history of the help information that you called up during your session. • In the top menu, go to Windows > Integrated Help. • From any of the other views, click on the View Menu arrow and select Integrated Help. • In the top menu, go to Help > Modules, then select either Show Help on Selected Module or choose from one of the listed module types. • In the Drawing or Camera view, use the Select tool to make a selection and then click on the Show Help on Selection button in the Help view. • In the Timeline view, click on the layer that you would like to identify. 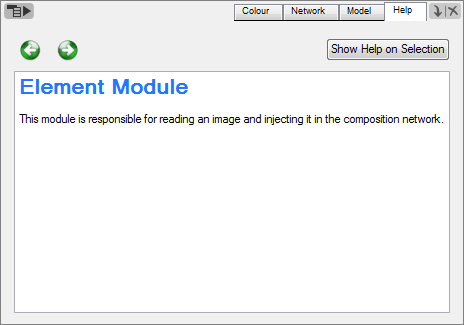 • In the Network view, click on the module that you would like to identify. A description of the selected layer/module appears in the Help view. • In the top menu, go to Help > Show All Shortcuts. A list of shortcuts appear in the Help view.